Check out the latest features in Virtuous! Happy autumn! Fall is in the air, kids are back in school, and we've got a bushel full of new features for you! Read on to see what's waiting for you today in Virtuous. First off, we did tease a new email feature, didn't we? And it's here! Now, you can add Individuals (yes, Individuals! You read that right.) to Email Lists. These Lists will be visible on a Contact record, where you'll see an Email Lists box in the lower left that displays the name of any Lists an Individual is subscribed to, and the First Name of the subscribed Individual. Individuals can be added to Lists from the results of an Individual Query, or one at a time on a Contact record. For more, check out our complete support article on Managing Email Lists. If you track media placement and the success of those placements, you'll probably be excited to hear about our new Media Outlet Management feature. Now, from the Data Management tab on the Settings menu, admins can create new Media Outlets and codes to track on a Gift record, alongside the Segment Code. 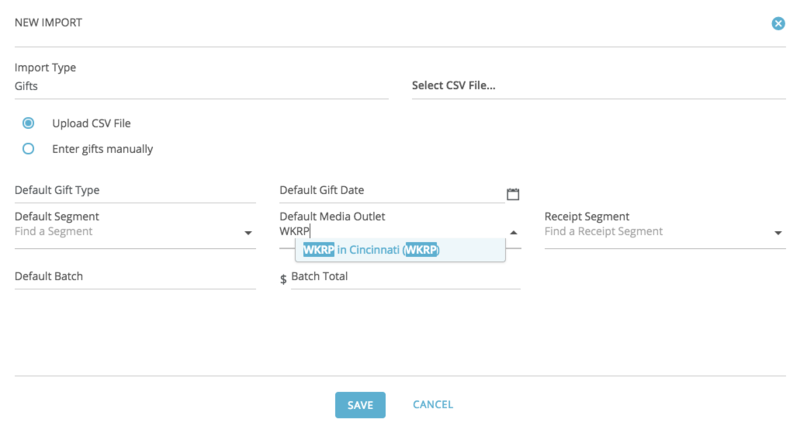 When entering Gifts, users can even specify a default Media Code for an import, or enter a value directly on a Gift record. Sometimes, you just want to process a credit card while importing gifts, y'know? And now, Virtuous Giving users can! 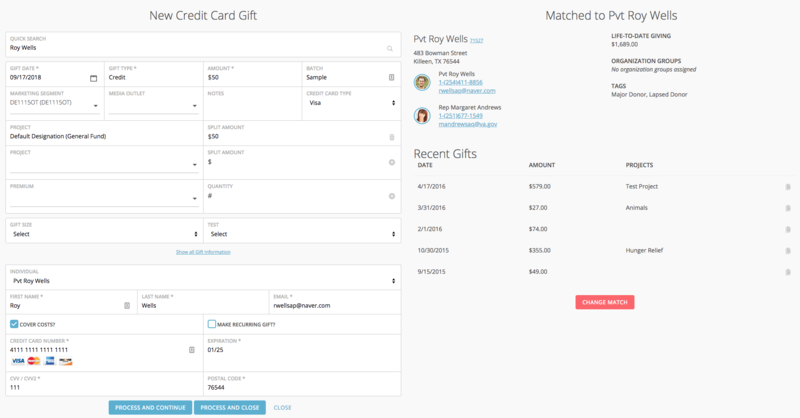 Just select "Process Credit Card" from the Actions menu in the Gift and Contact Import tool, and you'll be able to search for a Contact and key in a credit card to process a transaction and import the Gift, all directly in Virtuous. And speaking of Virtuous Giving, donation forms now support bank account (ACH) giving! 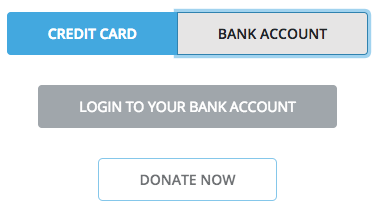 Users can add the Pay With Bank Account field to any donation form to provide donors with this option. Bank account giving is also supported on the donation form on every donor portal. Users who select this option will be prompted to log in to their online banking account to authorize their transaction. In our most recent release, we switched to a new system for auto-completing addresses when performing data entry tasks, and many of you reached out to ask for the good old address verification system, with the familiar green check mark. Well, you asked, and we answered. It's back! Look for the green verification button in the Gift & Contact Import tool, or when adding or editing an address on a Contact record. Frequent Query Tool users (and other observant types) may notice that we've made a change to our query naming system. No longer will queries be automatically assigned the current date as a placeholder query name. Instead, new queries will have a randomly-generated ID assigned, which can be deleted and changed to a proper English name (or any language, really, we're not going to quibble) when saving. We've made this change because, going forward, all queries must have unique names. This means that if you edit a saved query that shares a name with other shared queries in your Virtuous environment, now you will be prompted to rename your query to ensure that all query names are unique, like beautiful data snowflakes. When a new address is identified during Gift entry, users will now have the option to not only add or ignore the new address, but to add it as the Primary Address. Huzzah! Users who have DonorSearch integration on their account will be pleased to know that the integration, which was not working for a short time, is now working again. And we have worked with DonorSearch to improve the quality of wealth data results. Because we like you. We really, really like you. Ever wondered what some Individual's middle name was? Well, now you won't have to - Middle Name will be displayed by default when viewing any Individual on a Contact record. Some users noticed some bad links in our Welcome to Virtuous emails. Thanks! We went ahead and made those working links again. Projects with a fixed need amount were displaying these amounts as "Monthly." amounts. We understand this was confusing, so we've fixed that to make things less so. Some eagle-eyed observers may notice that the favicon for Virtuous has changed color. If you are one of them, thanks for noticing. If you have any questions about these or other features, feel free to contact our team using the support widget in Virtuous, or drop us a line at support@virtuoussoftware.com.